Journal d�Orgue (?-1784): 1. Grand Choeur-Pastorale, 2. Elévation, 3. Trio de grosse Tierce, 4. Récit de Nazard, 5. Quartetto, 6. Duo, 7. Rondeau, 8. Récit de Tierces, 9. Grand Choeur-Carillon des morts pour le gloria patri au Magnificat de la Toussaint, 10. Dialogue de flûte et Cor qui se fait sur les Echôs, 11. Offertoire Conceto de hautbois ou flutte, 12. Dialogue pour le hautbois et la flûte, 13. Récit de voix humaine, 14. Marce pour les rentrées de processions, 15. Offertoire en simphonie Concertante, 16. Récit de Flûte, 17. Duo, 18. Récit de Cromorne, 19. Grand Choeur en Dialogue, 20. Noël-Duo, 21. Noël- Récit de flûte, 22. Noël-Tambourin, 23. Noël-Muzetto, 24. Noël-Récit de Voix, 25. Noël, 26. Offertoire-Rondo. Organ by: Christoph Moucherel, 1725/Restoration by Bartolomeo Formantelli, 1991, Monastery Church of Mouzon, Ardennes, France. 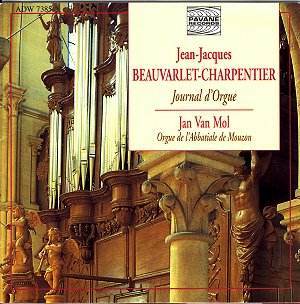 Jean-Jacques Beauvarlet-Charpentier was a distinguished organist of his time. In 1772 he succeeded Daquin as an organist of St Paul du Marais. In 1783 together with Louis Couperin, Balbastre and Séjan, he served in Notre Dame on the basis of a quarterly rotation. Since 1784, Le Duc published 12 issues of his compositions of �Journal d�orgue à l�usage des paroisses et les communautés religieuses�. The booklet says that these pieces �give a good insight into the "decadent" style of organ music as performed by the Paris organists towards the end of the 18th century�. This music, though intended for liturgical use, has not the same religious feeling as much as Bach�s for example. On the contrary it is a humorous, light music, which certainly would have been enjoyed by the congregation of that time. Maybe it would have been enjoyed in a different way than Bach�s or Buxtehude�s music, but the end result is what matters. The writing is not easily recognizable as organ writing. Since it borrows formulas from Viennese classicism, it resembles the simplest piano sonatas of the period. In the two Offertoires (nos. 11 and 15), the organ plays both the role of orchestra and solo instrument. The booklet notes, though brief, contain basic information about the composer and give the registration of the pieces. Van Mol�s playing tends towards the stolid and little of the latent energy of these pieces is materialised. He lacks a good control of articulation especially when he uses the reeds or the high-pitched stops. In this case the pipes do not speak clearly and each one covers the sound of the next one. What suffers most is the bass line. Van Mol fails to reveal the expressiveness of the Récit pieces, which sound metronomic. In general, Van Mol�s playing sounds too serious for this sparkling and humorous music.